In the early days of television, animation was the medium of choice to sell a product to the masses. Automobiles, cigarettes, patent medicines and even alcoholic beverages were presented to the TV viewing public via the animated commercial. Animation is relatively inexpensive to produce and when done cleverly, very memorable. One of the most clever and memorable animated commercials created for Detroit TV was The Faygo Kid, created to sell Faygo soda pop. 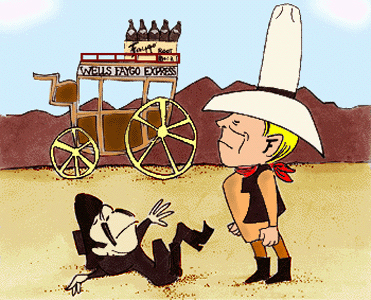 From the mid 1950s thru the early 1970s The Faygo Kid guarded the Wells Faygo Express, preventing Black Bart from pilfering the stagecoach’s precious cargo; a case of Faygo Root Beer. The history of Faygo goes back to 1907, when Perry and Ben Feigenson rented a building on Winder street in the Eastern Market area of Detroit to manufacture and bottle soft drinks. Their original flavors, Strawberry, Fruit Punch and Grape were based on cake frosting recipes the brothers perfected as bakers in their native Poland. A few years later Lithiated Lemon, Rock & Rye and Sassafras were introduced to the growing stable of flavors. In 1921 the Feigenson Brothers Bottling Works name was shortened to Faygo. Sassafras Soda was reformulated in the 1940s and renamed Root Beer. In 1954 the W.B. 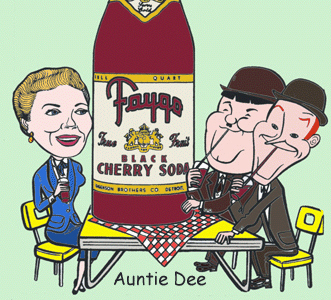 Doner Advertising Agency was hired to create a TV commercial for Faygo Old Fashioned Root Beer. Doner enlisted the help of Storyboard, an independent studio headed by former Disney animator John Hubley. A political activist, Hubley was forced to leave his position as creative vice president of UPA Animation Studios in 1952 when he refused to appear before the House Committee on Un-American Activities. In 1953 the blacklisted animator found both financial and creative freedom with Storyboard, where he worked in relative anonymity with his wife Faith, producing TV commercials. The Faygo Kid spot was budgeted at $20,000, more than twice the amount of the average animated commercial of the era. The original ad was shot in black and white on 16mm film, clocking in at 72 seconds. In the late 1950s when color programming became more widespread, the commercial was dyed a sepia tone and edited down to 60 seconds. In the late 1950s John Hubley created more animated spots for Faygo. Neither was as successful as The Kid, but Hubley will go down in TV history as the creator of pop icon Marky Maypo, the finicky two year old who exclaimed, “I want my Maypo!” The success of Storyboard’s commercials gave John and Faith Hubley the economic freedom to create a series of highly stylized animated theatrical short subjects utilizing the musical talents of such Jazz greats as Dizzy Gillespie, Ella Fitzgerald and Quincy Jones. The Kid went into semi-retirement in 1972. He made a comeback in 1981 when Doner pulled the original commercial out of mothballs and presented it to a new generation of Faygo fans in its original black and white. In 1997 Faygo aired a nostalgic compilation of their commercials, featuring a short clip of The Kid, in celebration of their 90th anniversary. In 1987 Faygo Beverages was sold to the National Beverage Corporation. Faygo still manufactures more than 40 flavors of soda pop from their state of the art bottling plant near downtown Detroit. The current popularity of Faygo with teenagers might be attributed in part to the Horrorcore rap group Insane Clown Posse, who have chosen Faygo as their beverage of choice, often singing about it at their concerts while dousing concert goers with Faygo pop. CLICK HERE to see the original Faygo Kid commercial from 1954.